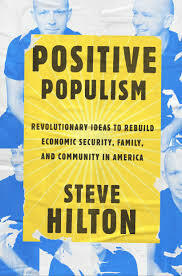 Wherever you stand on the political spectrum, you’ll find something to love AND something to hate in Steve Hilton’s new book, Positive Populism. That’s exactly why you should read it. And think about it. Hilton is an interesting character whose life is a key part of this book. His parents were working class immigrants from Hungary who were struggling to fit in to the United Kingdom when he was born in 1969. He won a scholarship to Oxford and ended up working for the Conservative Party which propelled him onto Prime Minister David Cameron’s personal staff in 2010. He soon become a media star as well as a close advisor to Number 10. After falling out with Cameron over Brexit, Hilton and his family moved to Silicon Valley, primarily because she took the first of several positions she has held in leading tech firms. Hilton himself has taught at Stanford’s D School, built and lost a startup, and now has a show on Fox News. At a time when political polarization is at what seems like an all time high, Hilton’s book tries to defuse some of the tensions, which might seem like an odd goal for someone who works for Fox News and has never been associated with the left. Yet, that’s exactly what he tries to do in this book. He tries to make the case that populism does not need to be racist, sexist, or xenophobic. He also does not think that populism has to lead to leftist economic solutions either. In terms of the economy, he tries to strike a balance between security for all which the left would like and a commitment to market principles that have long been honored in the breach by right and left alike. Put simply, he calls for limited government but also for a government that is one partner in providing a society that works for everyone. A commitment to fairness which means accepting the diversity that characterizes life in countries like the US or the UK today. At the same time, he has doubts about the amount of immigration countries like them can tolerate without falling into the xenophobic trap we currently find among conservatives on both sides of the Atlantic. He makes the case for universal health coverage and a guaranteed living wage for all workers although not exclusively through government programs. Fairness is at the heart of everything he talks about. Thus, he is pro-family but also endorses all kinds of families, not just those championed by the religious right in the United States. Like many commentators on the center left (Robert Putnam) and center right (David Brooks), he supports strengthening communities and goes farther in seeing their transformative potential than most other scholars. He calls for a renewed sense of patriotism which led him to support both Trump and Brexit. However, unlike most people who share such views, he opposes all forms of racism and jingoism. Many readers will have the hardest time with his vision of a populist government because Hilton does line up with the new wave of conservatives and even uses terms like deep state and draining the swamp. However, his critiques and proposals are just as trenchant for those he ends up supporting come election time. From where he sits, Republicans are as guilty as Democrats when it comes to creating elitist institutions. He would like to see the big state decentralized as much as possible and to have the power of money eliminated as much as possible. It took me a long time to read this book despite the fact that it is both reasonably short and quite well written. It took me a long time because I had to think especially about the ways the ideas he raises could be used to bring left and right closer together. Maybe not today. Maybe a few years down the road when/if cooler heads like his begin to prevail.